VIEWS from our veranda are unforgettable! Enjoy your morning coffee on the veranda while hearing the ocean waves crash, seeing how a busy Island coastline moves with peace and tranquility - in the evening, witness the sun setting into the very ends of the Atlantic ocean. We are located steps away from the city beach, restaurants, and clubs, and just a 15 minute walk to the center of town. Our building is secure, and equipped with an elevator which begins on the second floor. There is a water desalination site located outside of our building which makes a humming noise. Minutes from the beach, and a short 15 minute walk to the center of town! Bars, clubs, and restaurants located on the beach. The view of the bay, sunrise and sunset is incredible! If you would like to arrange transportation from the airport to our condo, we have 15 passenger air-conditioned vehicle available upon request, the transportation rate from the airport to condo is €10. Het appartement is groot (3 aparte slaapkamers, 2 badkamers en een aparte keuken). Je hebt een fantastisch uitzicht over stad, strand en zee. Het is van alle benodigdheden voorzien en is schoon. Wij hebben geboekt voor 2 volwassenen en 2 kleine kinderen (1 en 3 jaar oud). De verhuurders Paulo en Angela zijn erg vriendelijk en attent. Ze helpen je met alles en zijn snel in hun communicatie (in goed Engels). We hebben ook een halve dagtrip met Paulo over het eiland gedaan, ook een aanrader! Paulo spreekt goed Engels en kent alle bezienswaardigheden. Hij neemt de tijd voor alle plekken en de trip is de moeite waard. We enjoyed a lot our stay in this apartment! We stayed in the apartment for 2 days. It was comfortable for four of us (4 friends from Belgium doing tour in Cabo Verde). Angela and Paulo took care that we felt there immediately at home. The apartment is clean and nicely decorated. The kitchen is very well equipped with a nice bonus coffee and tea were at our disposal:) Living is spacious with a stunning view at a nearby bay. Beds are comfortable. Neighbourhood is safe and quiet. The apartment definitly to be recommanded. One more thing Paulo can give you a ride to the airport that we found very convenient. Angelo and Paulo thank you so much for this nice stay in Mindelo! We enjoyed having Aneta and friends stay at our Condo! They were great guests, responsive and took very good care of our place! They are welcome back anytime! Very nice condo with magnificent view! 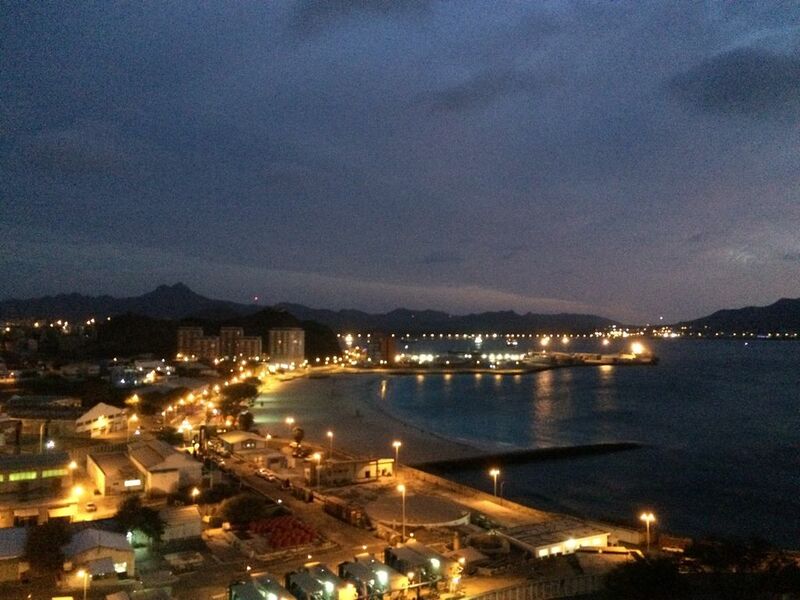 This condo is worth booking when you go to Mindelo. It's on 15 minutes walking distance from the centre of the city. 10 minutes to the beachclub. The condo was clean and spacious. At some points maintanance is required but not disturbing. The service of Angela en Paulo is excellent! We had a very pleasant stay! It was a pleasure to have Noël! He is welcome back anytime!